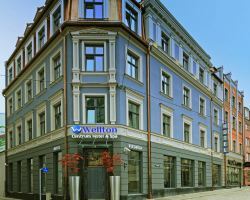 Wellton Riverside SPA Hotel is a high comfort hotel in Old Riga: directly next to sightseeing objects, shopping venues and business centres. 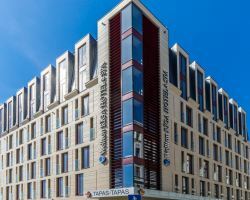 Wellton Riverside SPA Hotel is a high comfort hotel in Old Riga: directly next to sightseeing objects, shopping venues and business centres. The hotel’s personnel provide guests high-quality service with an individual approach, to cater to the needs and wishes of each guest. Wellton Riverside SPA Hotel is the best choice for organising conferences and events in Old Riga. The hotel has 222 high comfort rooms, the amenities of which will be appreciated both by tourists and business people. The hotel has a 638 m2 spa complex SPA Riverside, a restaurant with a wide range of food and drink, and rooms for events, conferences and banquets. For bigger events, we suggest the Panorama Hall: a room on the hotel’s 8th floor with a terrace and a breathtaking panoramic view of Latvia’s longest river, the Daugava. Every Wellton Riverside SPA Hotel conference room is equipped with flip charts, video projectors, screens and other audio/video equipment and accessories necessary for conference work. On the hotel’s first floor, there is a restaurant providing a wide range of coffee break, banquet and group catering options to accommodate the specific needs and wishes of guests.